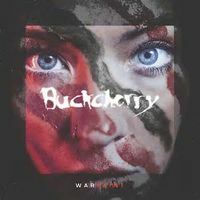 We have not heard from BUCKCHERRY in four years, but now this L.A. rock band is back with their eighth release, “Warpaint”. After a lot of lineup changes, all that is left of the original band is vocalist, Josh Todd. I looked forward to this release because I have enjoyed earlier BUCKCHERRY and I was excited to read, Mike Plotnikoffwas producing. However, after discovering Keith Nelson was no longer in the band, I became a little nervous if losing the founding guitarist and taking on their fifth drummer would hinder this release. So, let’s break some of it down. From the get-go, “Warpaint” reminds me that BUCKCHERRY is a fun band. If SoCal rock appeals to you, this title track is gratifying. Easy to join in and sing along, it appears Josh Todd’s voice is still on point. Catchy, radio-friendly instrumentation is a must for L.A. rock and it seems we are off to a good start. However, my hopes are quickly dashed when “Right Now” comes in; not digging on the chorus, guitar work or overproduced vocals. However, I push through because I am excited to hear what they do with the NIN cover, “Head Like A Hole”. Francis Ruiz and Kelly LeMieux set a great tone and are delivering a bit faster than the original, but the vocals kill it for me. I don’t mind it is sped up; I actually enjoy the instrumentation very much. If you know this track, you are aware that Trent Reznor serves a dark, almost rageful delivery of his lyrics; he sounds as if he sings through gritted teeth. Unfortunately, Josh Todd’s vocals make me question if the pick up in tempo was a wise choice. Because he is trying to sing faster, the track loses its eerie appeal and the vocals read listless. Josh Todd technically sings them well; it just doesn’t grab you like you want it to. I recognize and appreciate BUCKCHERRY’s attempt to instrumentally make this cover their own; unfortunately, it falls a little short for me. “Bent” is one of the better tracks on “Warpaint”, but vocallevels continue to be a problem for me. First issues is he is turned up way too loud in comparison to the rest of the band. Second issue is, once again, it is technically heavy handed, too sterialized. This pains me to say because I am a big fan of Mike Plotnikoff’s work with HALESTORM and ALL THAT REMAINS. As the release plays on, it is just more of the same. There are some appealing instrumentations to grab hold of throughout, but the songwriting and production is killing me. In “No Regrets”, Kevin Roentgen’s guitar work is greatly appreciated and breathes some life into this release, but every time the vocals chime in, everyone else seems to be turned down and shoved in the background; it is really beginning to piss me off because I think this is a talented group of musicians. Last track, “The Devil’s In the Details”, proves to me they saved the best for last. I really dig this catchy track and it shows me what this new configuration can do, I am just not sure why we had to wait so long to hear it. This release was tough to review. No decent reviewer wants to feel they have turned on a band they once enjoyed. Maybe BUCKCHERRY just simply needs more time together to fully develop their new sound. Perhaps they spread themselves too thin, too quickly and should have concentrated on seven or eight really solid tracks instead of twelve. I will be better informed if there is a ninth release and I will remain optimistic because I do think, if this lineup can hang tough and keep making music and honing their sound together, BUCKCHERRY can rise again. My unsolicited advice: please allow the instruments to shine and for the love of rock-n-roll, turn down the vocals and turn up the bass!